KUDOS Shower Products was created with a simple mission 'to provide industry best products, supported by world class service'. Using the latest design technology, material and production techniques. KUDOS has developed a range of reliable, high quality shower products designed with you in mind. Owned and managed by a team with a wealth of experience in the shower industry, who share a vision that customer service should never be compromised, always expected and forever maintained. A choice of stylish enclosures, doors and trays that offer excellent value, with innovative features designed to meet the demands of today's busy lifestyles. Elegant, practical and easy to maintain, KUDOS products not only look great but operate efficiently and will keep their attractive appearance despite the rigours of modern life. 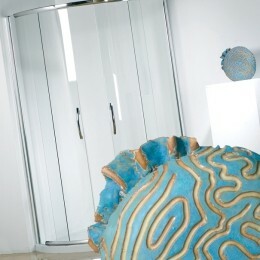 Telephone us for details and prices for a Kudos Newport4ma wet room system. Superbly engineered from the highest quality materials, all KUDOS products are guaranteed to last a lifetime. These Kudos shower enclosures and many more are all available to purchase from Newport Bathroom Centre so please telephone us on 01633 262629 for our latest brochures, prices and offers. Often imitated, seldom matched but never surpassed, KUDOS Original doors and enclosures have set the standard in showering excellence, superb engineering, design and value being the hallmark for the brand. Using up to 6mm toughened safety glass on all products are covered by the KUDOS lifetime guarantee, featuring concealed fixings throughout with a unique height adjustment to ensure perfect performance. The KUDOS semi-frameless collection combines minimalist elegance and style with practical installation and performance. Featuring glass to glass panels up to 8mm thickness and crystal clear seals giving a jewel like appearance worthy of the name Infinite. Design features include stunning chrome effect wall sections, plated brass corner joints and a unique three dimensional adjustment system. The KUDOS ULTIMATE range of walk in showers and wet room panels featuring the unique KUDOS shower tower for a fully integrated showering solution. 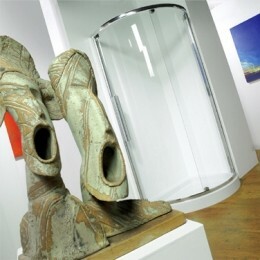 Performance and comfort to match the dynamic style of the walk-in enclosure. The ultimate shower experience is provided by the sleek integrated KUDOS shower tower that not only directs water away from the door-less opening but ensures that the bather is comfortably positioned within a draft-free shower. 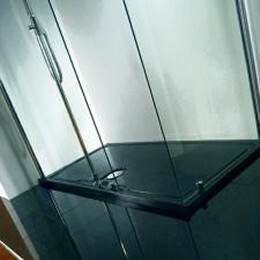 Choosing the right shower trays is essential to the performance and appearance of your new shower. KUDOS CONCEPT shower trays are available in a wide variety of shapes and sizes some uniquely suited to KUDOS enclosures and all covered by the KUDOS lifetime guarantee. KUDOS Concept 2 shower trays feature an acrylic capped abs skin with a resin bonded stone filler, providing strength, stability and appearance. Concept 2 shower trays are only 55mm high and have a plain standing area, just perfect for creating that minimalist look. Kudos Concept 3 shower trays are manufactured from a unique formulation that looks and feels like granite and provides the ultimate wet room appearance with the ease of installation.